A veteran Pacific affairs journalist is calling on New Zealand to do more to raise media standards in the Pacific. A VETERAN Pacific affairs journalist is calling on New Zealand to do more to raise media standards in the South Pacific. Papua New Guinea has a strong pool of trained reporters from two journalism schools, but other countries like Fiji have suffered because fewer than half of their journalists are trained. Dr Robie says the result is many fresh journalists are unable to deal with political pressure and corporate spin. 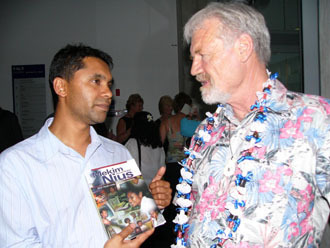 The political coup in Fiji, when renegade businessman George Speight attempted to overthrow the Mahendra Chaudhry government at gunpoint in 2000, is a prime example, he says. He says Speight used the media to gain a "credible" profile. Journalists came in and lived with Speight and his supporters in Parliament. It was a case of the Stockholm syndrome where the hostages begin to sympathise with their captors," he says. "Journalists believed what they were told." Dr Robie believes better New Zealand government funding and more specialist media expertise would help prevent this occurring again. But he is quick to point out the the pressure Pacific journalists face. "There are really good journalists in the Pacific - really dedicated and courageous," he says. "In New Zealand, the worst thing you'll face is a defamation case. In the Pacific, politicians will publicly castigate journalists, personally name them and give them flak. Journalists also face threats and physical assaults. An award-winning journalist and the author of eight books, Dr Robie was in Fiji when Dr Timoci Bavadra was elected to power in 1987 and Dr Robie covered the subsequent coups. he has been arrested at gunpoint several times and was banned from working in apartheid South Africa and Zaire. Dr Robie was on board the Rainbow Warrior when it evacuated Rongelap Islanders from their irradiated atoll, taking leave three days before it was sunk by French secret agents. Budding reporters trained under him at the University of Papua New Guinea and the University of the South Pacific for 10 years before he came back to teach in New Zealand. Dr Robie says it is short-sighted to dismiss the standard of Pacific journalism as unimportant. "We have our heads in the sand if we are not interested in our smaller neighbours," he says. "Everything that happens in the Pacific affects New Zealand. We should be more aware of what's happening - whether it's a coup, terrorism or organised crime." He is also critical of New Zealand media coverage of Pacific affairs. "Quit frankly, it's appalling," he says. "Very little is reported. Then a crisis like a coup occurs and everyone is jumping up and down, saying: 'Why didn't we know about this?"